The Models 105 & 106 are part of the NEW generation of Pulsar Instruments acoustic calibrators that allow you to quickly check the accuracy of your sound level meter or dosemeter thus complying with International regulations and codes of practice. Great care has been taken during the design process to ensure that the units are comfortable to hold, robust and easy to use, whilst performing accurately throughout a wide range of temperature, humidity and pressure conditions. In use they fit over the microphone of the instrument and produce a stable 1kHz tone at 94dB, the frequency and sound level repectively, as mandated by the standard. The Model 105 meets the precision of Class 1 of IEC 60942, while the lower cost Model 106 meets industrial Class 2. The calibrators are powered by an easy to access single 9 volt battery giving many months or even years of operation. An automatic shut-off circuit ensures power conservation should you forget to switch the unit off after calibrating. Applications - Most noise related regulations stipulate that the sound level meter or dosemeter is calibrated before each measurement session and checked again before turning the instrument off.Noise measurements made for 'official' use, such as industrial health and safety or environmental monitoring, are not valid unless correct calibration procedures have been followed. Operation - Using the Models 105 or 106 the calibration process is very easy. The calibrator is placed over the microphone of the sound level meter and started by pressing the ON button, making sure the microphone is right inside the calibrator cavity. On older, manual meters the calibration is adjusted, if necessary, using the small screwdriver supplied. On the later computer controlled meters, a CAL button is pressed and the internal computer automatically adjusts the meter to the correct reading. The additional 'permanent-on' mode can be selected to check the integration function of a sound level meter. 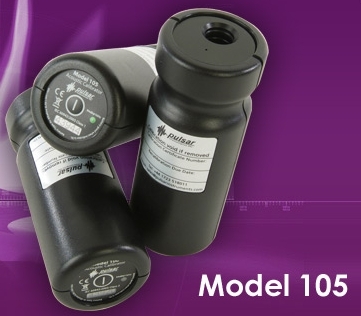 Ordering Information - While both models can be ordered separately, they are most often supplied as part of the sound level meter measuring kit, the Model 105 for a Class 1 meter and Model 106 for Class 2 meters. Each calibrator is supplied complete with a certificate of calibration, a full user manual and a battery.